John 1:16 – 17 (KJV); And of his fullness have all we received, and grace for grace. For the law was given by Moses, but grace and truth came by Jesus Christ. When we talk about TRUTH in it’s absoluteness, it can never be TRUTH if it doesn’t depict its source from the love God has toward man kind, revealed in Christ Jesus. The Bible says in our theme scripture “the law was given by Moses but grace and truth came by Jesus”. Firstly it’s important to note that Moses was simply a giver of the law. The Bible says the law was given by Moses, it was not a part of his person and identity. On the other hand Jesus didn’t only give us Grace and Truth, Grace and Truth came by him. This was not something he passed on to us because he thought we needed it, it was part of the assurance that He had come because He is the embodiment of Grace and Truth. The number one guarantee of His presence in your life as a Christian is the evident display of grace and truth in your life. 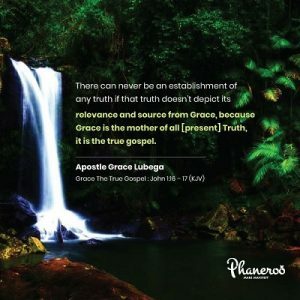 There can never be an establishment of any truth if that truth doesn’t depict its relevance and source from Grace, because Grace is the mother of all [present] Truth, and it is the true gospel. PRAYER: My loving Father, I thank you for your Grace. It is more than just a doctrine, it is your person my Lord. I stand steadfast in its understanding and I am established in its precepts. Every day I grow in this present truth because it is the bedrock of the new covenant. In Jesus’ name. Amen.